Aerostone’s full range of Hebel-based green building materials are relatively easily to mould and design, and are exceptionally strong and fire resistant and are able to withstand the harshest of Australian weather conditions. The fire properties of our Hebel moulds achieve the highest ratings of any competitors moulds and coupled with the fact that they are not made from a core of polystyrene, longevity is also a trademark of any Aerostone mould. With style and longevity at the heart of everything we do, our building mouldings offer great value for just about any residential or commercial project. There is more to choosing a greener alternative than just face value – it’s a smart decision for our environment and your wallet too. Because we use autoclaved aerated concrete, our moulding products offer a 30% lower environmental impact than their concrete and brick veneer counterparts. Plus, aerated concrete products produce 55% less greenhouse emissions compared to similar building products, making it a more sustainable, environmentally friendly choice of building material. Value for Money: Because it’s made from hard-wearing Aerostone, our architectural mouldings last longer than other products which means less maintenance and better value for your home. Quick to supply: Using an exclusive machine, we’re able to shape and supply external mouldings within industry-leading times. Australia’s harsh environmental conditions are known for putting most building products to the test. 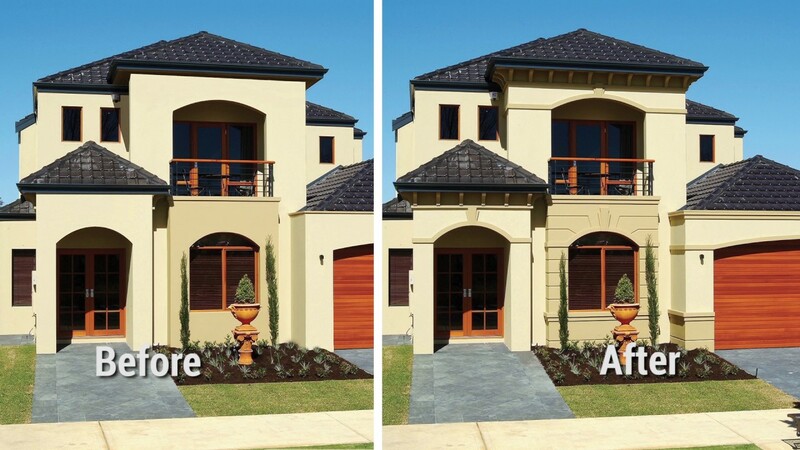 That’s why Aerostone’s decorative mouldings are built to withstand harsh conditions like hot temperatures, bushfires and storms, which considerably reduces the need to replace mouldings over time. Aerostone’s standard decorative mouldings offer a wide selection of styles, but if you can’t ﬁnd what you’re looking for, our team can design a moulding that is suited to your particular application – whether it’s for a window frame, outdoor pillar, wall capping and more. Just let us know what you’re looking for and we’ll tell you how soon you can have it. Plain banding is used to frame or separate areas, as well as to cover joins or imperfections. Special consideration needs to be given as to whether the banding is protruding enough to fulfill its function. Rebated banding, also known as stepped banding, is used when you want a bit of depth or layering rather than just a flat band. Rebated banding can be used as a cover strip between ground and first floor. Special consideration needs to be given to fixing over areas that will move. Only one side can be solid fixed, which is generally the top as you don't want water to get behind. Profiled banding is used for close visual appeal, or to suit the period style of the home. Profiled banding offers a level of detail to featured banding, which is mostly appreciated within 10-15m of the building exterior. Otherwise colour variation can be used to visually display the feature better at a distance. The use of profiled banding and colour gives the best visual feature. Plant On Sills, also known as Face Fixed Sills, are moulds that are fixed to the face of the wall where the top of the mould is level with the bottom of the window. Plant on sills are used when the building is built with brick up to the window. This type of mould will require rendering to the top of the brick sill to give a seamless look from the window to the bottom of the band. When you want to have a slope on the top of the window sill, commencing from the bottom of the window, a built-in sill is the best option. Built-in sills require bricks to be left out to all of the sills and to be installed under a window frame. This can be used as part of the sill or as the complete sill and is usually seen on Federation style windows. Special consideration needs to be given to ensure that the base of the sill is a combination of the wall thickness plus the overhang. Skirts are the ornate sills that drape down from the window sill. This can be on its own or in the combination of a face fixed or built in sill. Either way, you must allow for the added thickness of the skirt. The shapes are cut out of 25mm thick bands and the pattern is set out even from the centre with common traits to all. Skirts are typically used for Colonial or Federation styles and can be applied to Modern style homes when used on their own. Sill supports are little feature blocks under the protruding sill. This gives the impression that the sill is being held up by the supports. The supports can be any shape, but as a rule, they should not protrude beyond the sill. These moulds are generally used for Colonial style homes to give additional character. Special consideration must be given to make sure that the sill protrudes enough to allow for the sill blocks. This will ensure that the supports do not become a hazard that could be bumped into. Rendered sills are used to cover exposed brick on face fixed (plant on) sills or skirts on face brick walls, and gives the impression of a continuous solid piece. This is explained further in Rendering Reveals. Fully framed window surrounds are where the same band is used all around the window to emphasise the windows and add depth. Fully framed surrounds generally suit taller than wider windows. In all cases, when applying the mould on face brick, the vertical band should extend out to the most protruding brick. This will allow for the ability to render and maintain a flat, straight band. Heads and sides are window surrounds that are used only at the head and two sides of the window where a sill of different sized material is to be used. Heads and sides are generally used in combination with a sill, or to a doorway where no sill is required. Head and downturns are window surrounds used at the head of a window and dropping only part of the way down the sides. Head and downturns create a feature at the top of the window, used to either highlight the window or become part of a continuous band at a lower level to the window heads. Head and downturns are used when the windows are solitary and don’t interact with anything else. Sloping faced keystones are thicker at the top and taper down to a thinner edge at the bottom to give a sloping effect. This gives a more pronounced appearance overall, without looking too thick. These are also used when a keystone is required with a profiled band. Rustic keystones are used when a natural chiselled stone appearance is preferred. These feature pieces are bordered with a smooth rim to give a neat appearance. Profiled feature keystones are created from a profiled band which is cut down to a short section with returns on each side. The keystone will suit plain banding or profiled bands, but the thickness will need to be adjusted to suit. Profiled keystones can be used for extra pizzazz, or to counteract sloping keystones that protrude too far. Feature keystones can be designed to suit particular building styles or to client requirements such as Art Decor or customised keystone moulds. Feature keystones are generally used to highlight building entries, windows and doorways. Splayed springers are normally used when the window is isolated and banding does not continue horizontally or vertically. The springers as per the keystones can be plain or splayed to suit the style of the home. Profiled springers are short sections of a profiled band with one end returned and the other square, working in pairs. The flat square edge finishes at the window reveal, while the other returned end would usually run past the band that terminates on the springer. Individual tiles with a gap left between the tiles and joining at the corner is referred to as Individual Quoining with a Gap. This type of moulding is used when an authentic look is not critical. The rebated or square edge look is a more modern feature and the gap can be to the client’s appeal, normally 30mm to one brick course. Consideration should be given if the Quoins need to match face brick coursing. Individual quoining with a gap is best suited to rendered walls. Stepped quoins are very effective on Colonial style homes, generally 3 to 4 courses high and longer than higher (longest of the quoins), recommended with chamfered edges. Consideration should be given to whether the quoins need to match face brick coursing. Base thickening to piers is very effective in highlighting the portico columns or piers. This involves bulking out the base of the piers, giving it a solid base look. This type of base thickening is also used to highlight protruding walls from the main house such as bay windows or feature walls. Profiled edges give a more ornate finish to the base thickening edge and can be used on front elevation, piers and protruding walls that are to be made into a feature. The profiled edge is normally only allowed on the top edge, stopping in line with window and door reveals, and not returning in to garage opening. However, windows and garage door openings can be revealed if they are on face brick. Wall cladding is used to build out a wall face and creates depth by leaving deep grooves or patterns imprinted into the wall. It is also used in a similar fashion for base thickening but may or may not continue down to ground level. Carving or routing will give an individual and unique feature wall. When you apply a mould or a sill on a face brick wall, quite often the top or side of the brick sill or window reveals stands out. This highlights the fact that the product is planted on the face of the wall. What you want is the sill or mould to look as if it is a solid piece built into the wall, so you can’t tell where the Aerostone mould stops and the brick wall starts. This is achieved by applying a thin skim of Aerostone adhesive or polymer render over the reveal or sill. This is then sanded back to blend the finish into the Aerostone product. Parapet moulds are used to finish off the face of a wall that extends above the roof line and are generally used in Mediterranean style homes with hidden roofs and porticos. As a guide these should be 200 – 300mm high. We recommend that the parapet flashing covers the top of the mould to avoid water escaping. Wall capping is used to sit on top of a low height wall, overhanging on one or both sides. This type of moulding enhances the appearance of planters, garden walls, and fences. Generally made to order, the overall width of the wall cap viewed from both sides would be the wall thickness plus twice the thickness of the preferred profile. If only viewed from one side, then only one thickness of the preferred profile needs be allowed for. Pier caps are used to sit on top of fence piers and are generally made to order. The overall width of the pier caps viewed from all sides would be the pier width plus twice the thickness of the preferred profile. The top of the pier can be flat or pyramid shaped. Another option to give the impression of a flat top pier is to run a profiled band around the top of the pier and skim render the top. Plain collars are used to visually increase the thickness of column bases where standard ornate collars may protrude the base. Most ornate collars are thicker at the bottom and thinner towards the top. Plain collars can be made to the same thickness keeping the protrusion to a minimum. Profiled collars are ornate collars created from one of the profiled cutters, used to visually increase the thickness of column bases. These can be set on a square base or used individually. These define the start and end of vertical circular columns, which would otherwise appear pipe-like and plain. Exterior house corbels are a protruding feature piece that can be used to add a bit of European charm to the eaves. These mouldings are generally used at eaves or balconies but can be used where an overhang occurs. Plain piers are used to give the illusion of structural supporting piers and are solid fixed back to a supporting background. A rectangular vertical pier (attached to a wall), can be used to accentuate a door way or entry. Alternatively, a recess can be used to insert stone or tiles leaving a framed boarder. Plain piers work best when a trowel on texture coat is to be applied. Profiled piers are used where you wish to create a tall feature or focal point and are solid fixed back to a supporting background. The profile should be complimentary with the overall style of the home. Unlike the plain piers, these may not be suited to having a trowel on texture coating due to the complexity of the design, making application difficult. Therefore, a paint on finish would be more appropriate. Bulls eyes are used to reduce the blank areas created when a pitched roof creates a high wall face. These moulds are generally featured on gables or on low level garden walls and circular windows. A standard bulls eye mould consists of a circular band (profiled or plain) with four keystones to suit, which are incorporated as the North, South, East and West points of a compass. Vent surrounds are trims around ventilation grills used to highlight grills that may be bland and need to be framed. The vents may be real or imitation and the surrounds are used simply to enhance the appearance; creating a feature. These may include banding, keystones, springers and sills.